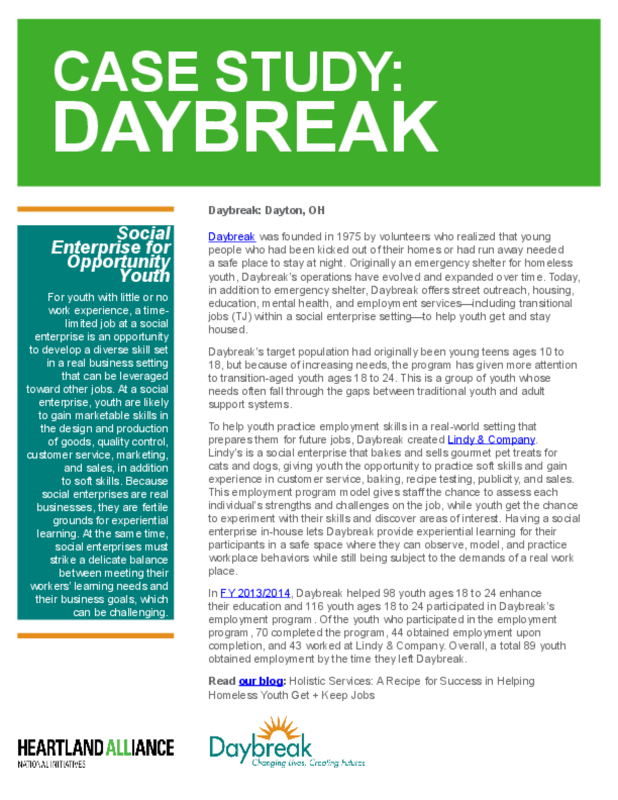 This resource is a case study on Daybreak, a program that offers emergency shelter, street outreach, housing, education, mental health, and employment services -- including transitional jobs (TJ) within a social enterprise setting -- to help youth get and stay housed. Daybreak's target population had originally been young teens ages 10 to 18, but because of increasing needs the program now gives more attention to transition-aged youth ages 18 to 24. 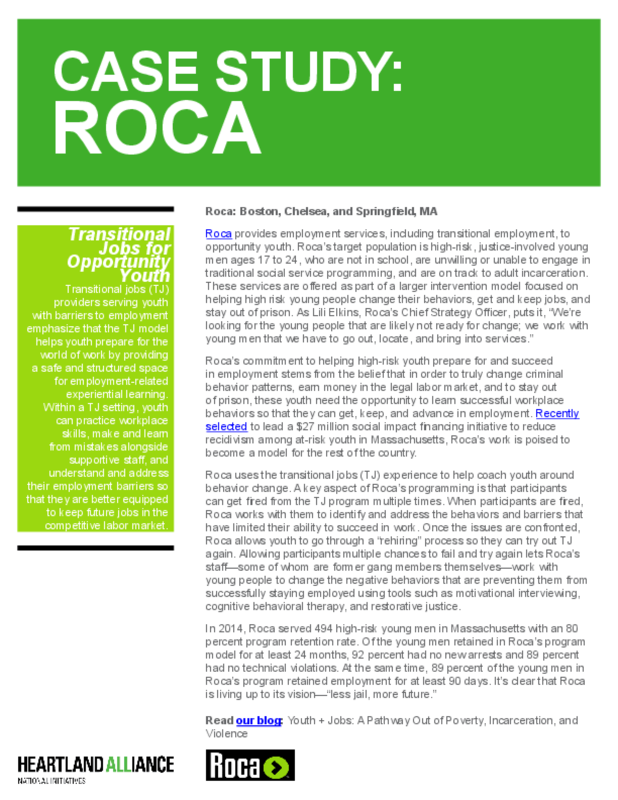 The resource is a case study on Roca, a program that provides employment services, including transitional jobs, to opportunity youth. Roca's target population is high-risk, justice-involved young men ages 17 to 24, who are not in school, are unwilling or unable to engage in traditional social service programming, and are on track to adult incarceration. 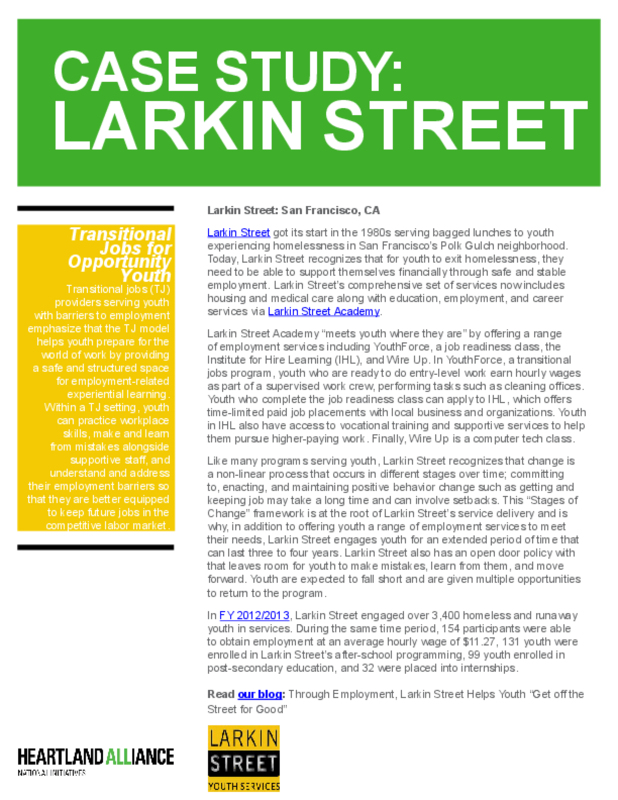 This resource is a case study on Larkin Street, a program that includes housing and medical care along with education, employment, and career services via their Larkin Street Academy. Larkin Street Academy "meets youth where they are" by offering a range of employment services including YouthForce, a job readiness class, the Institute for Hire Learning (IHL), and Wire Up. Young adults with histories of foster care or juvenile justice custody experience poor outcomes across a number of domains, on average, relative to their peers. While government funding for services targeting these groups of young people has increased in recent years, research on the effectiveness of such services is limited, and few of the programs that have been rigorously tested have been found to improve outcomes. The Youth Villages Transitional Living Evaluation is testing whether the Transitional Living program, operated by the social service organization Youth Villages, makes a difference in the lives of young people with histories of foster care or juvenile justice custody. The program, which was renamed "YVLifeSet" in April 2015, is intended to help these young people make a successful transition to adulthood by providing intensive, individualized, and clinically focused case management, support, and counseling. 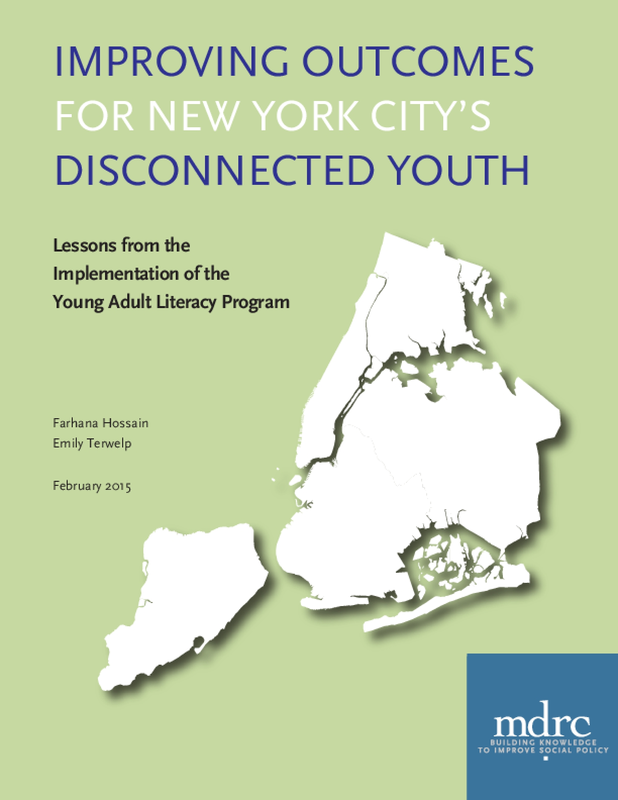 In 2008, New York City's Center for Economic Opportunity (CEO) launched the Young Adult Literacy (YAL) program to improve the academic and work-readiness skills of youth who are not in school, do not have a job, and have very low literacy skills. In fiscal year 2013, eight community based organizations and the city's three public library systems operated the program at 17 sites, with oversight from the Department of Youth and Community Development. The YAL program targets 16- to 24-year-old young adults who read at the fourth- through eighth grade levels, and serves them until they are academically ready to enter a program that prepares them for a high school equivalency (HSE) certificate. The year-round program offers up to 15 hours of literacy and numeracy instruction each week, along with social support services, life skills and work-readiness training, a paid internship, and some modest incentives. Voices and Visions of Youth in Transition, a longitudinal transformative youth-centered research study, examines the experiences and thoughts of youth as they transition out of foster care at the ages of 17, 19, and 21. Qualitative and quantitative survey inquiries were used to attain an understanding of the experiences of 198 youth in foster care who were 17 years old during the first wave of data collection. Nine critical areas related to the transition out of foster care were examined: education; employment; housing; high-risk behavior; access to health insurance; social connections with adults, family, and friends; the transition plan; transition concerns; and personal goals. The majority of youth reported the importance of resources, social support, and personal habits and skills as they prepare for the transition out of foster care. Youth also expressed concerns about being on their own without adequate support and not being able to make it on their own. 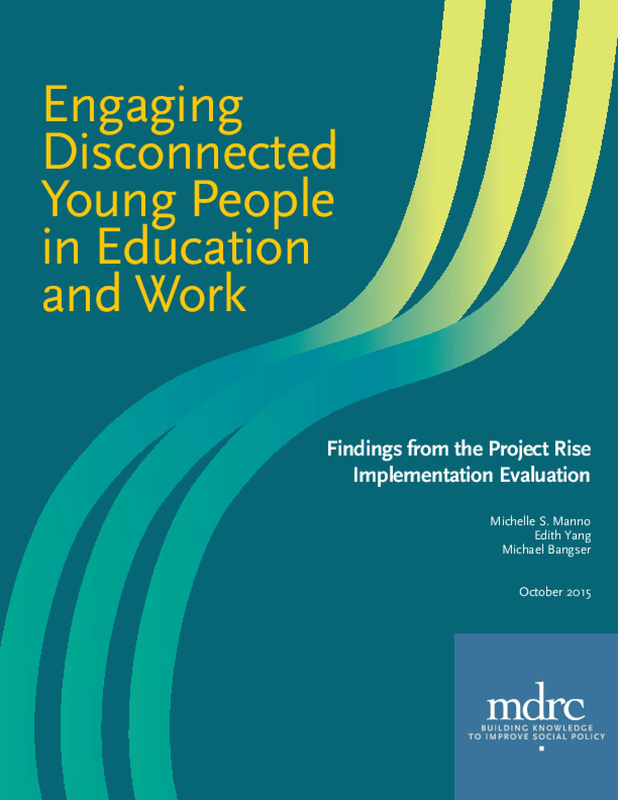 This article highlights the study's findings from the first wave of data collection and how youth in transition are meaningfully engaged and empowered throughout the research process. Research shows that many out-of-school youth want to return to school, but are uncertain how to do so and are fearful they will not succeed once they get there. Helping these young people find alternative pathways to graduation – and productive and promising futures – is a critical challenge facing municipal leaders today. Fortunately, a growing number of cities are leading the way with innovative strategies that provide multiple routes to graduation for all students. These efforts include the establishment of one-stop "reengagement centers" for high school dropouts. The centers offer a range of services such as individual academic assessments, opportunities to explore different education options and referrals to appropriate schools or other credential programs. 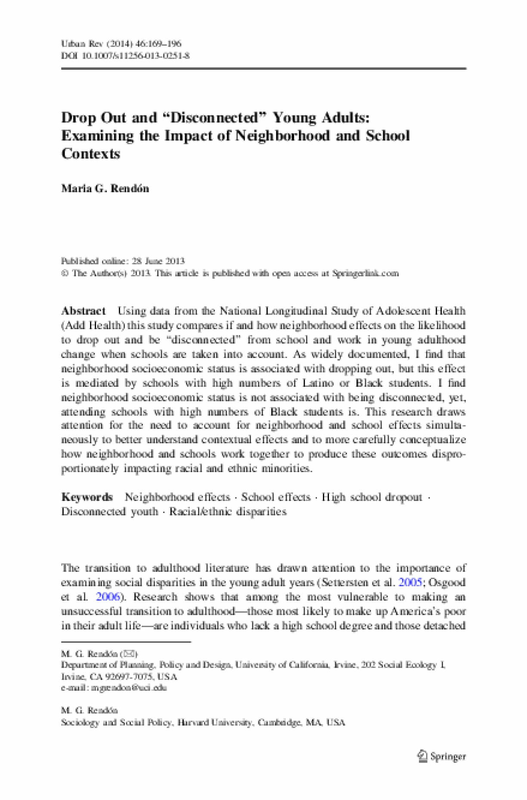 Using data from the National Longitudinal Study of Adolescent Health (Add Health) this study compares if and how neighborhood effects on the likelihood to drop out and be "disconnected" from school and work in young adulthood change when schools are taken into account. As widely documented, I find that neighborhood socioeconomic status is associated with dropping out, but this effect is mediated by schools with high numbers of Latino or Black students. I find neighborhood socioeconomic status is not associated with being disconnected, yet, attending schools with high numbers of Black students is. This research draws attention for the need to account for neighborhood and school effects simultaneously to better understand contextual effects and to more carefully conceptualize how neighborhood and schools work together to produce these outcomes disproportionately impacting racial and ethnic minorities. Massachusetts, like many other states and municipalities across the US, is grappling with a tremendous challenge: With increasingly strained budgets and growing social need, how can government funding be directed towards evidence-based programs that offer demonstrated cost-savings? Pay for Success and Social Impact Bonds (PFS/SIB) have emerged as potential mechanisms for making smart investments in effective social interventions by changing the way Government allocates and invests its resources -- focusing on results and outcomes. In short, funding what works. In May 2011, Massachusetts issued a Request for Information (RFI) with the goal of helping the Commonwealth determine "the areas of government activity where success-based-contracting strategies have the potential to improve outcomes and/or reduce costs." The Justice System is one area of government activity with the potential to illustrate both improved outcomes and well-defined cost savings for the Commonwealth. In addition, Massachusetts has a variety of established service providers that offer preventative initiatives to populations involved with the Justice System, particularly young people. 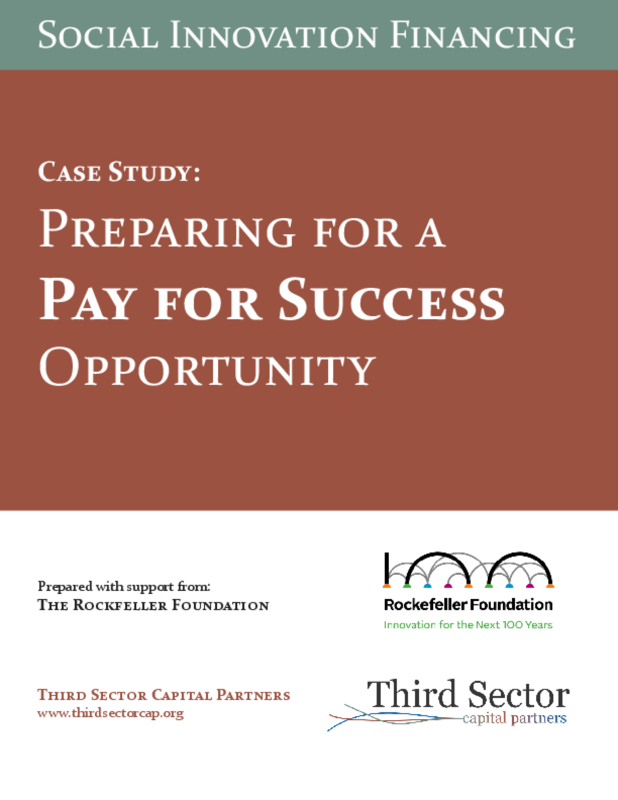 One of these successful and well-known providers, Roca, had worked with Third Sector Capital Partners (Third Sector) for a year and a half to prepare itself to be a successful candidate for this PFS/SIB opportunity. 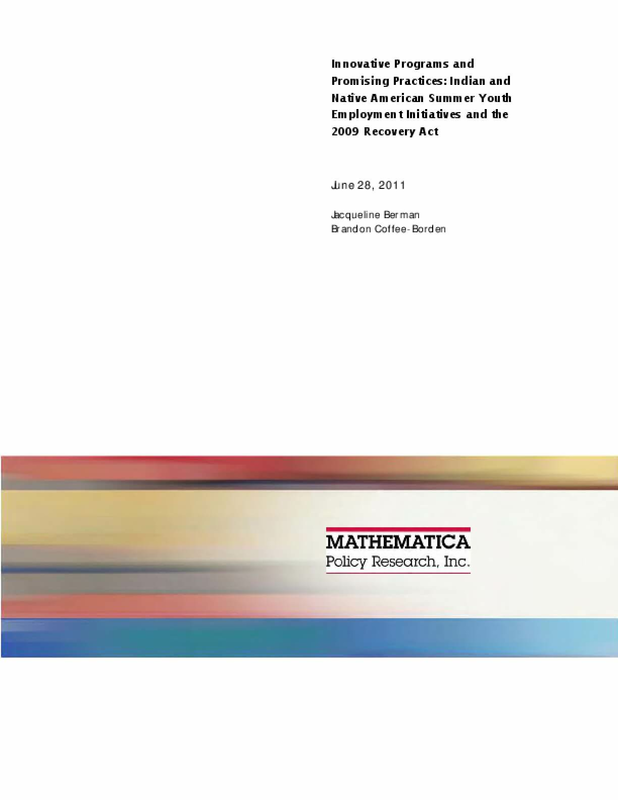 The American Recovery and Reinvestment Act of 2009 (the Recovery Act) used various strategies to redress unemployment challenges experienced by disadvantaged youth. The Employment and Training Administration (ETA) in the U.S. Department of Labor (DOL) received $1.2 billion for youth training and employment services. ETA allocated about $17.8 million of these funds to Indian and Native American (INA) youth through the INA Supplemental Youth Services Program. INA grantees were encouraged to use these funds to provide employment experiences to youth in summer 2009 and summer 2010. INA grantees responded by building on existing summer youth employment programs to extend services to additional youth, including older youth, and create new program components as appropriate and needed. 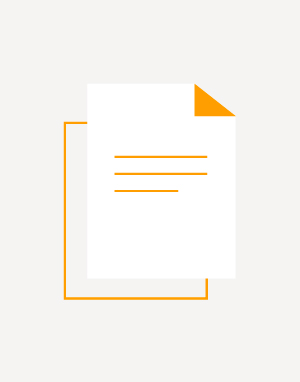 This report describes the context in which programs for the INA Summer Youth Employment Initiative were created and provides a detailed discussion of how grantees used their Recovery Act funds to implement programs to serve youth in their communities. The analysis is based on INA grantees' performance measure data and qualitative data collected during site visits to a purposive sample of five diverse grantees in five states. 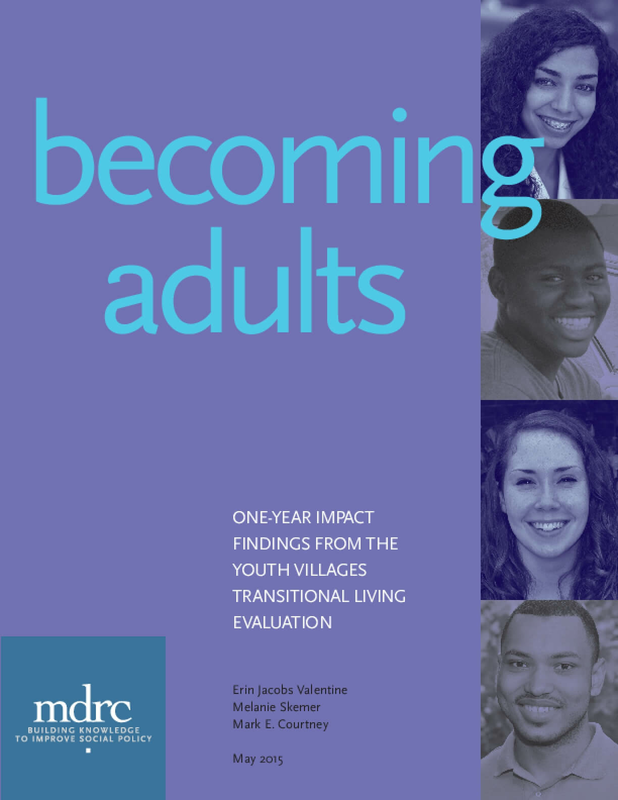 This report also highlights key findings and innovations grantees made to better serve youth. This report presents findings and recommendations from the Emancipated Youth Connections Project, a model program designed to seek and sustain permanent lifelong connections for older youth who have already emancipated from foster care without a permanent connection to a caring adult. See "Part 3: Project Results" for project evaluation. 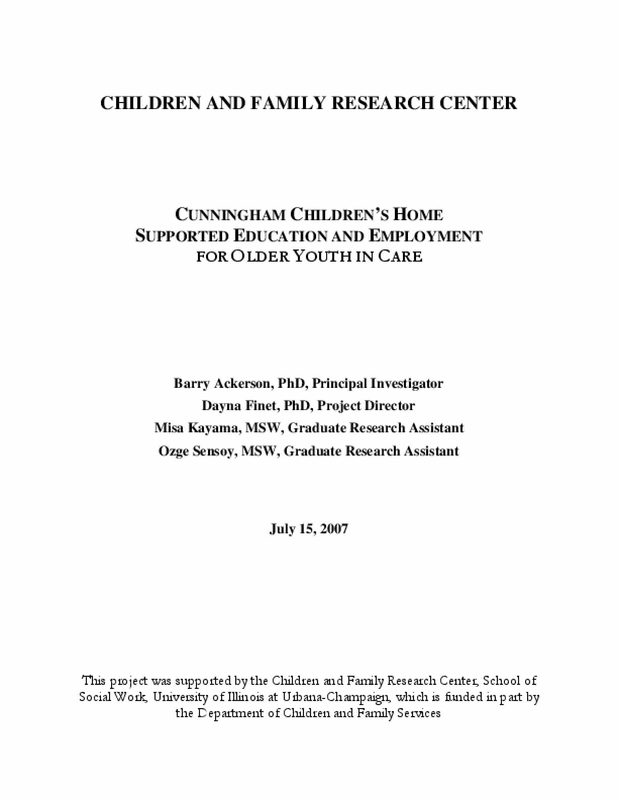 A collaboration of the University of Illinois School of Social Work/Children and Family Research Center and Cunningham Children's Home, the research described in this report analyzes empirically the status of Cunningham's existing vocational programming for foster children and youth. Data reported here primarily come from a survey of 58 Cunningham clients, supplemented by focus group data from a smaller group of Cunningham clients and information on occupational interest from a commercial computer-based career planning program (Career Cruising) used by Cunningham youth. Initially, researchers also planned to develop a supported education/employment pilot model designed to serve the specific population of foster children and youth. However, findings from the research suggest the need for a structure and curriculum more compatible with currently accepted models in community mental health and adult education than with the resources and supports available in a largely residential program like Cunningham. This represents a significant barrier to quick implementation of supported education/employment for the foster population, and so development of the pilot model has been deferred. Meanwhile, the authors have incorporated findings from this study into the Children and Family Research Center's ongoing research agenda on transitioning foster youth, expecting these results will continue to inform both research and practice supporting the progress of these young people toward successful adulthood. 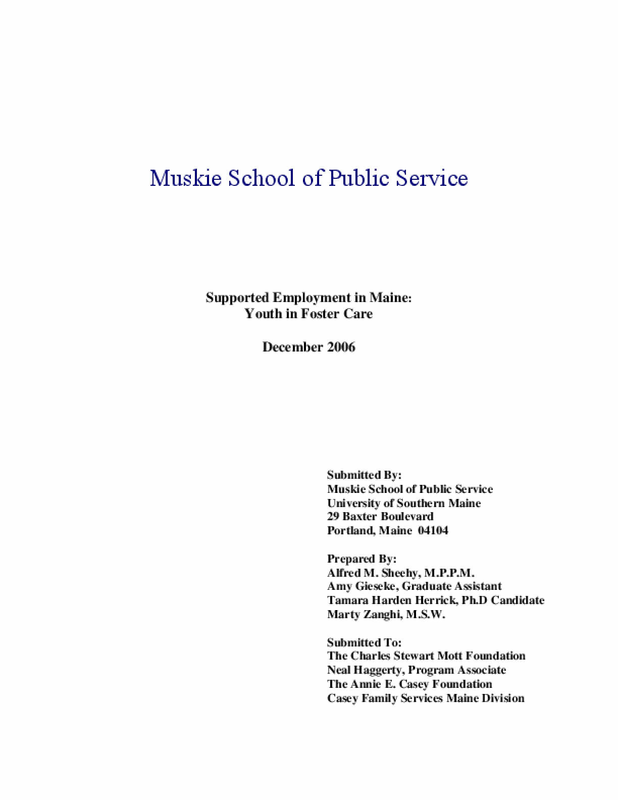 This report describes the employment experiences of 35 Maine youth in foster care. 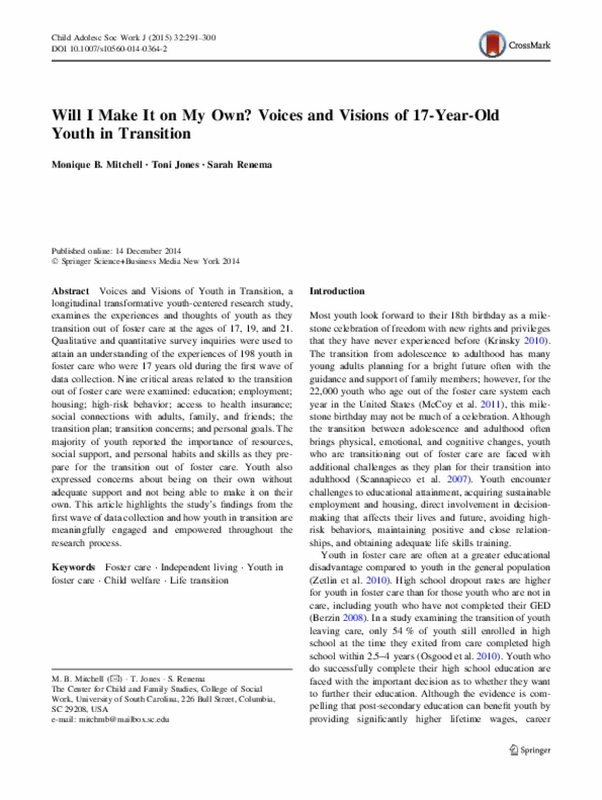 The study methods used included a quantitative analysis of the employment experiences of youth in care and a qualitative component that included interviews with five youth from the sample and four adults (a program job coach, a vocational case manager, a foster/adoptive parent, and a representative from a First Jobs business partner. 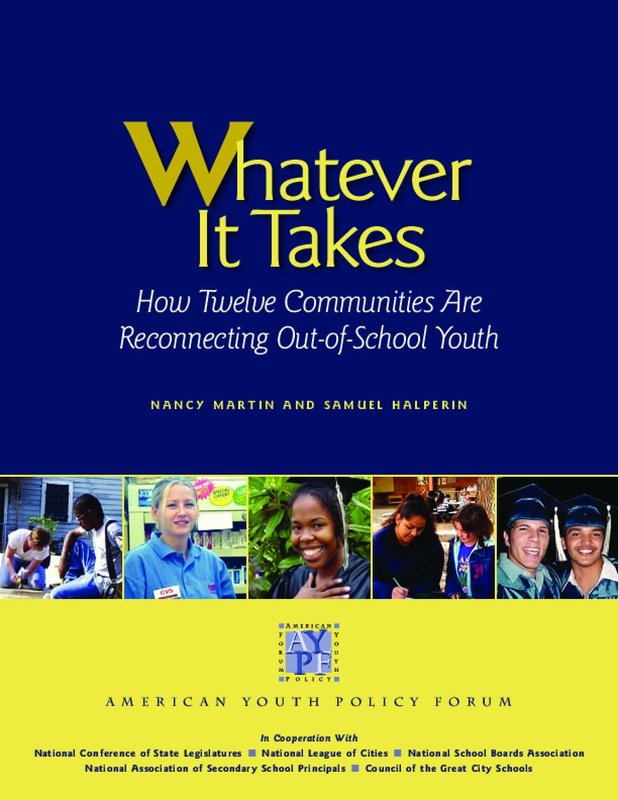 Whatever It Takes: How Twelve Communities Are Reconnecting Out-Of-School Youth documents what committed educators, policymakers, and community leaders across the country are doing to reconnect out-of-school youth to the social and economic mainstream. 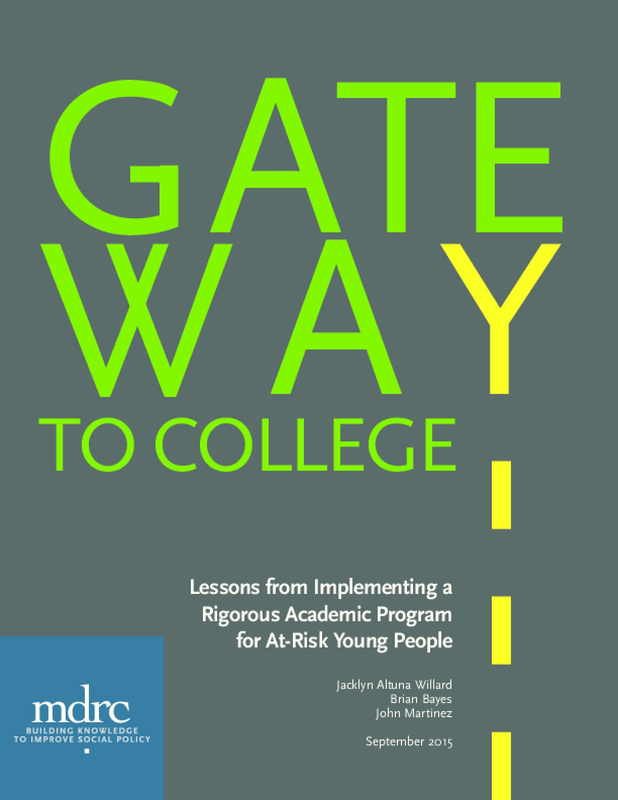 It provides background on the serious high school dropout problem and describes in-depth what twelve communities are doing to reconnect dropouts to education and employment training. 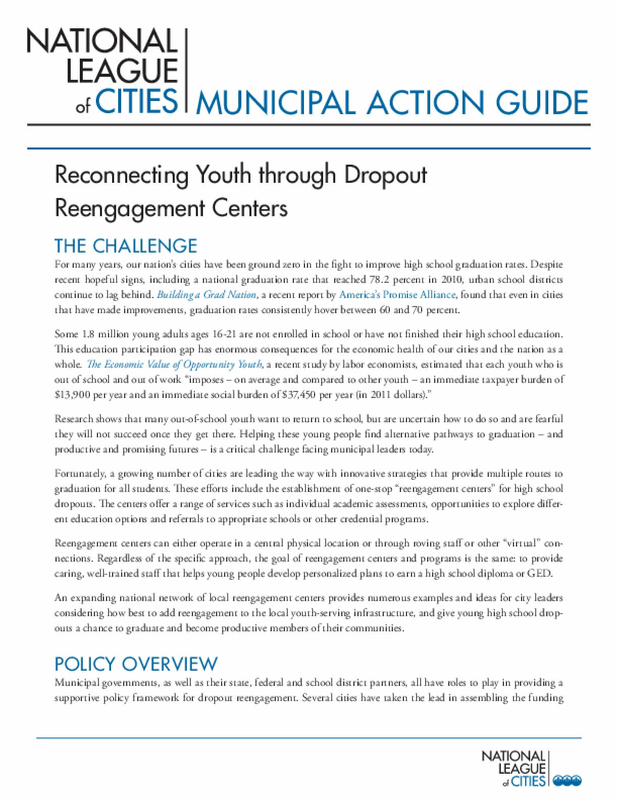 It also includes descriptions of major national program models serving out-of-school youth. 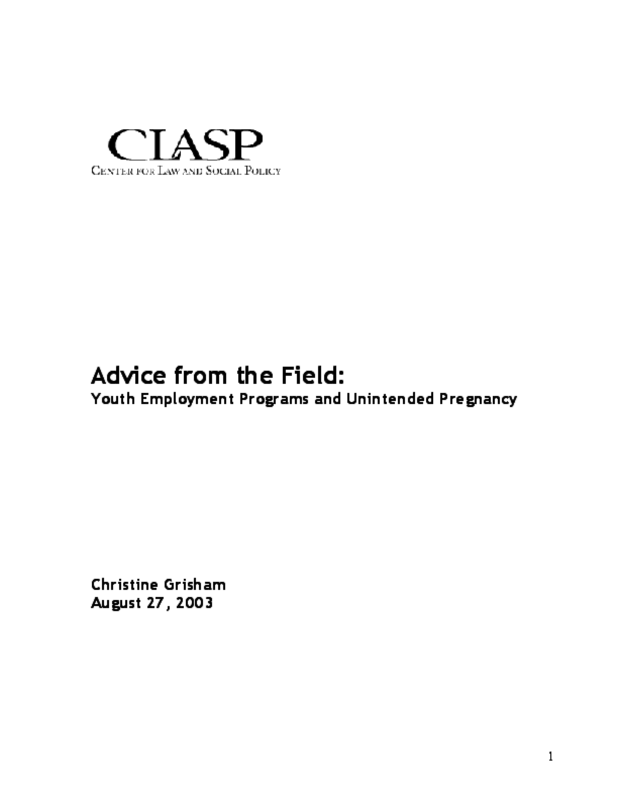 This report further explores the connection between the fields of pregnancy prevention and youth employment. It provides "advice from the field" from five youth employment providers about their efforts to combat unintended pregnancy and to provide family planning services. In addition, it includes interviews with two experts in the youth employment and teen pregnancy prevention fields, who provide advice and essential information for practitioners. 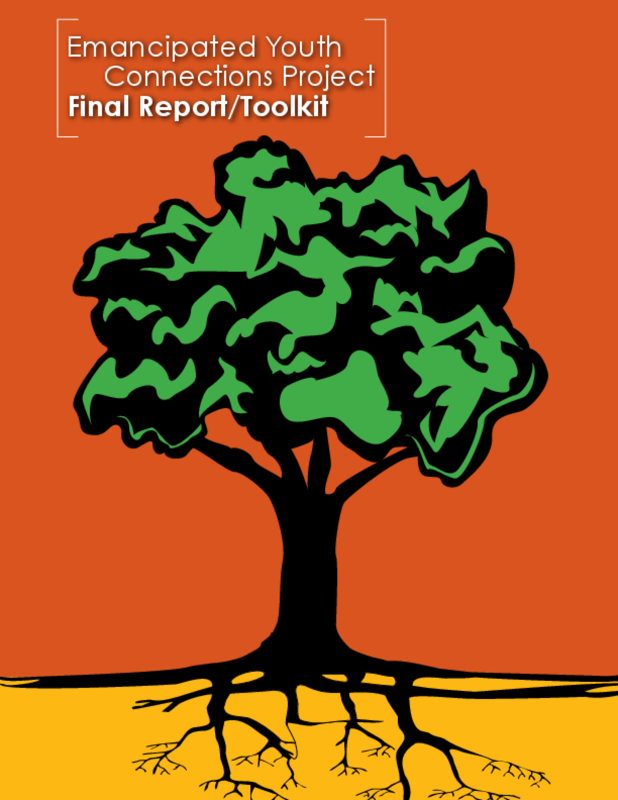 This report is intended to provide "how-to's" for staff in the youth employment field who wish to more innovatively integrate reproductive health education and unintended pregnancy prevention services into their programs.